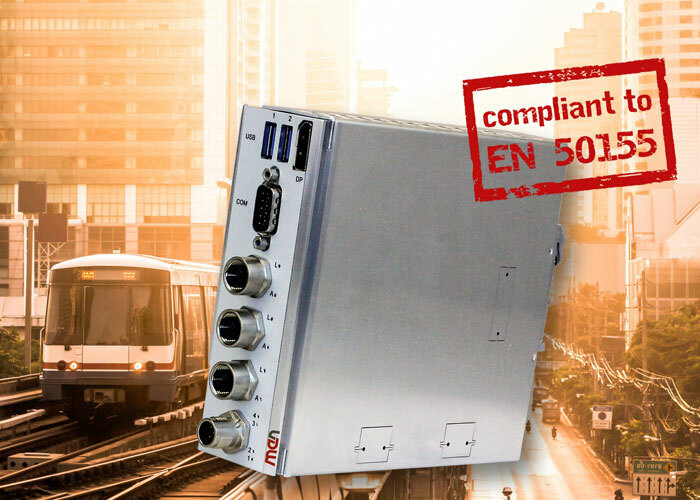 The MC50M is a modular gateway computer and part of the DIN rail family from MEN. The box is based on Intel's Atom E3900 series. It can be combined with CAN-based extension modules. The DIN rail box PC is suitable for embedded applications in transportation. The computer platform is based on Intel's Atom E3900 CPU series. This makes the product a basis for functions such as security gateway, predictive maintenance, CCTV, ticketing systems, or as a diagnostic server. The PC can be used as a stand-alone product or in combination with a range of pre-fabricated extension modules, providing additional features and short delivery times, said the company. Extension modules can provide application-specific functions such as wireless communication (LTE advanced, WLAN, GNSS), CAN, or other I/Os. A removable storage shuttle supports the integration of one to two 2,5-inch Sata hard disks/SSDs. The range PSU allows isolated power supply from 24 VDC to 110 VDC nominal and extends the entire system to EN 50155 compliance. The board management controller provides increased reliability and reduces downtime, said the company. The trusted platform module supports security and encryption features. With the ignition switch for remote startup and shutdown control, the platform provides additional energy saving features. The aluminum housing with cooling fins ensures conductive cooling and fanless operation. The MC50M has no moving parts, so it can be operated maintenance-free. The long-term availability of 15 years from product launch minimizes life cycle management by making the product available for at least this period. MEN’s DIN rail concept is designed for configuration of module combinations and is suitable for embedded IoT applications in various markets. The CPU modules can be combined with various expansion modules and power supplies. In the modular system, the data transfer between the individual modules as well as the power supply of the components is implemented via the expansion connectors standardized by the company. The concept specifications include housing dimensions, mounting, cooling and IP protection. In addition, the expansion connectors and their pin assignment are defined. DIN rail mounting (35 mm) is standard. Wall and 19-inch rack mounting is possible using adaption brackets.